How to add/edit/remove a deal? Open a contact and click on the Add Deal button (see A) below the Next Action area. 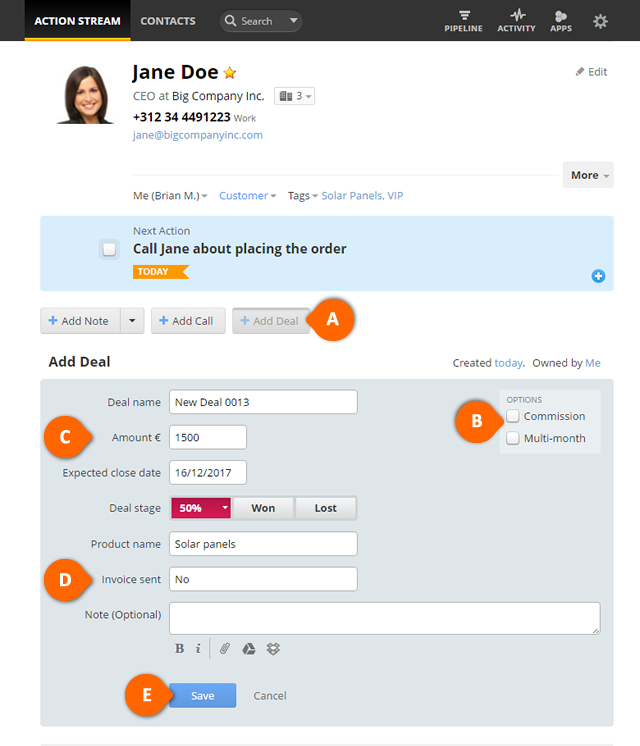 Type name for deal in the Deal name field. Specify an estimated deal amount in the Amount € field. Set Deal stage to a Pending probability percentage, Won or Lost. Attach documents from your computer, Google Drive or Dropbox. Select a deal owner from the Owned by drop-down list. By default this is set to Me. Choose any deal custom fields (see D) and to enable Commission or Multi-month calculating (see B). lick Save (see E) to create deal. Open a contact for which you wish to edit a deal. 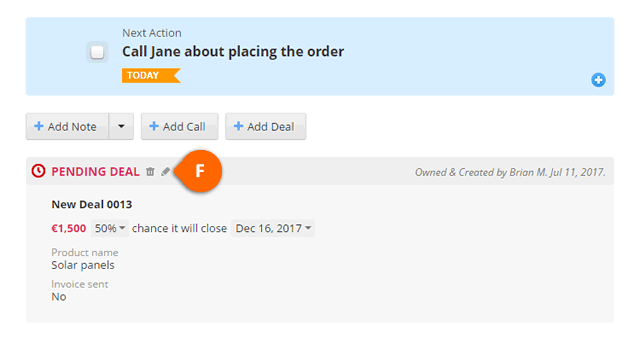 Click on the pencil icon (see F) in the Pending Deal box below the Next Action area. Open a contact for which you wish to delete a deal. 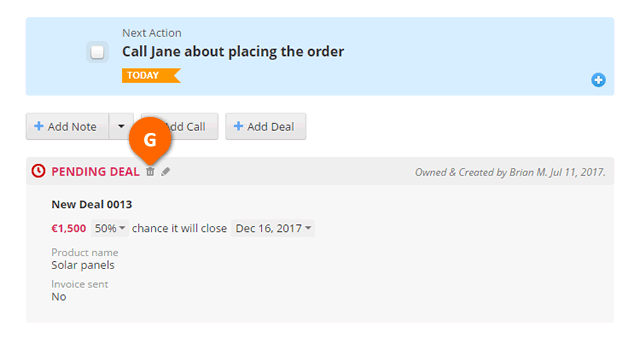 Click on the bin icon (see G) in the Pending Deal box below the Next Action area. In the warning message click OK to confirm deletion of the pending deal. To undo the deletion of a deal go to Activity Reporting > Deals and find deleted contact record you wish to restore> click on Undo delete link. You have only 24 hours to use the Undo option. You can also relate a note to a deal when creating a note. Once a related note is saved appears as associated note with a deal (see F). For more details check out How to add a note to a contact?.